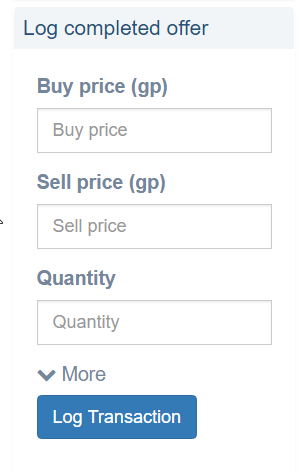 If you notice that a Buying Limit (GE Limit) is incorrect on GE Tracker, you can now click the Incorrect link and submit the new limit to staff for it to be updated on the site. This will greatly contribute to GE Tracker by providing our users with the most accurate information possible. As a QoL suggestion on reddit, Premium users now have the ability to log a completed transaction. Previously you would have to log the transaction in 4 stages (or via Active Transactions).